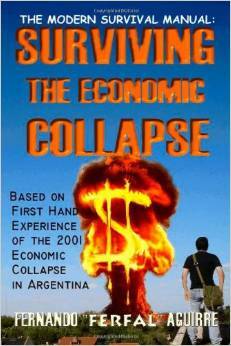 The Modern Survival Manual is based on first hand experience of the 2001 Economic Collapse in Argentina. In it you will find a variety of subjects that the author considers essential if a person wants to be prepared for tougher times: -How to prepare your family, yourself, your home and your vehicle -How to prepare your finances so that you don’t suffer what millions in my country went through -How to prepare your supplies for food shortages and power failures -How to correctly fight with a chair, gun, knife, pen or choke with your bare hands if required -Most important, how to reach a good awareness level so that you can avoid having to do all that These are just a few examples of what you will find in this book. It’s about Attitude, and being a more capable person and get the politically correct wimp out of your system completely. I highly recommend it. This entry was posted in Miscellaneous and tagged Economic Collapse, Ferfal, Fernando Aguirre on July 4, 2014 by GunGuy.